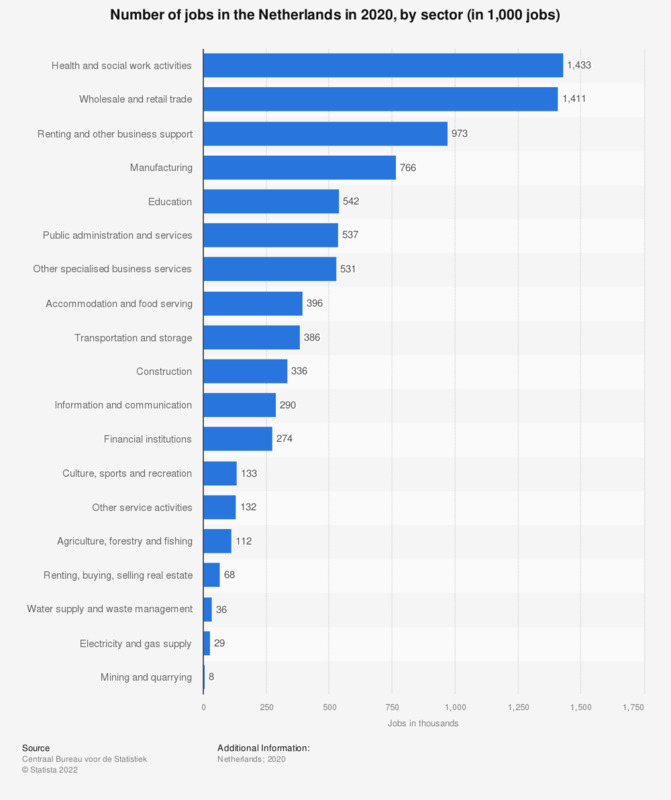 This statistic displays the number of jobs in the Netherlands in 2017, by sector, in thousands. As of 2017, the three sectors with the largest number of employees were the wholesale and retail trade sector, the health and social work sector, and the renting and other business support services sector. As of 2017, over 1.3 million people were employed in the wholesale and retail sector in the Netherlands. The source adds: "an employed person may have more than one job at a time. In that case the person has a main job and a secondary job. Each job counts separately. For the calculation of the average number of jobs in a certain period the starting date and end date of a job is taking into account. The weekly working hours are left out of account. Two successive jobs both with a 6-month working period will always count as one job in the average number of jobs, regardless of whether these jobs are full-time or part-time." In your opinion, has the Italian labor market improved following the Jobs Act in 2015?